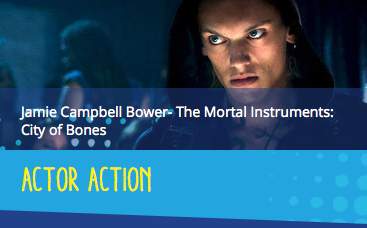 The Mortal Instruments: City of Bones has been nominated for three Teen Choice Awards in the first wave of nominations, including Action Movie, Actor in an Action Movie (Jamie Campbell Bower) and Actress in an Action Movie (Lily Collins). 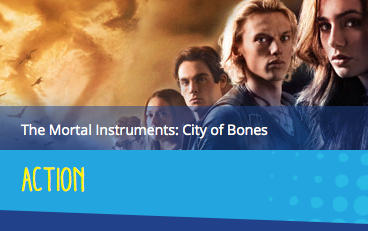 Head over to Teen Choice to vote for The Mortal Instruments! The Teen Choice Awards will air August 10 at 8/7c on FOX. I am so excited! The award show happens on my birthday, so that has to be some form of luck! Cannot wait for August 10th! My birthday is on the same day and we should both wish that city of bones win. We have double luck on our side! I have crossed fingers and toes in anticipation! @Miranda totally agree with you. 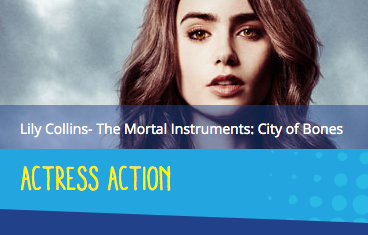 but I’m happy that it was nominated, so come on shadowhunters and downworlders VOTE!!!!!!! It’s a fandom website updating on the latest news! 2)what the hell was up with valentine’s hair? ITS MEANT TO BE WHITE!! have people forgotten the words hair dye? 3) seriously. What happened to battling in the hospital? why was it in the Institute? and why was there a portal in the Institute? also GO THE MOVIE AND LILY C AND JAMIE C! you deserve that award! great acting! Don’t forget the disaster that was Magnus Bane, the guy sounded like he was reading his lines from flashcards, definitely not our Magnus. Everything else I agree with, I hated Valentine! If it was just his hair I could deal but they totally changed the character, his menace was supposed to be in his control and startched appearance, not that whole lot of crazy that was going on with JRM. Honestly if they win the awards it may just give a boost to produce City of Ashes. I definitely think so and it’s up to us to make it happen. The mortal instruments needs to be recognised and if we win a few awards they will see that there are a lot of fans out there. We need to be supportive and show them that CofA is worth fighting for. I want to enjoy the story coming to life and not just be disappointed they didn’t work harder to make the movie as good as the book. I hope all three nominations end up as winners. I think Jamie could use the fan support. He is an amazing talent and I can’t believe how harsh people have been to him. He is a lovely person and deserves the award. I loved the movie, and had never heard of the books prior to, but have since read them all. I hope they take home some awards to make the franchise more viable. I can only say:I AGREE.I had never heard of the books either,but read them after watching the movie.I love Jamie as Jace.